The British delegation of twenty-five included Catherine Marshall, Secretary of the Section, Mary Sheepshanks, Ethel Snowden, Helena Swanwick and Ellen Wilkinson. 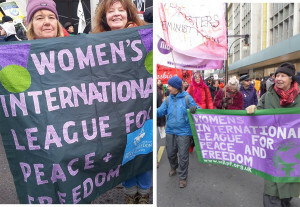 With the formalisation of a constitution at the Zürich Congress, the international women’s peace movement which grew out of the Congress at The Hague in 1915 established itself as the Women’s International League for Peace and Freedom (WILPF). ‘This International Congress of women expresses its deep regret that the terms of peace proposed at Versailles should so seriously violate the principles upon which alone a just and lasting peace can be secured …..